Psychological and Behavioural Sciences is an exciting, broad and flexible degree that covers all aspects of psychology. Psychology is very diverse – overlapping with and contributing to many other disciplines such as anthropology, archaeology, linguistics, neuroscience, philosophy and sociology. Psychological and Behavioural Sciences (PBS) at Cambridge gives you the opportunity to study cognitive, social, developmental and biological psychology within the broader context of the behavioural sciences. The course covers, for example, cognitive psychology, psychopathology, language, brain mechanisms, gender, family relationships and influences, personality, and group social behaviour. A wide range of options enable you to study the topics that interest you most in greater depth. In the Department of Psychology, you’re taught by lecturers and researchers of international excellence. Subject societies and seminar programmes offer regular talks from guest speakers too. In addition to this academic expertise, you have access to the Department library and specialist collections held in associated departments’ libraries – amounting to around 50,000 books and more than 150 periodicals – as well as other resources and computing facilities. All students are required to have a University approved calculator (c£20). Full course details are available on the PBS website and if you have any queries about resources/materials, please contact the Department. It is possible to transfer from another course into the PBS Tripos. Transfer is usually into the second year, when students will take four papers in total - the two Part 1A papers (Introduction to Psychology and Psychological Enquiry and Methods) and the two Part 1B papers (Social and Developmental Psychology and Experimental Psychology) before proceeding to the third year. Students wishing to transfer to PBS will consult their Colleges and the department and in some cases undertake a short assessment. 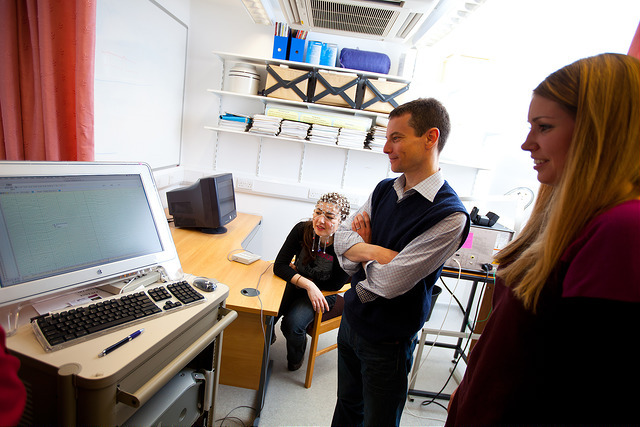 The University’s teaching of psychology is accredited by the British Psychological Society (BPS). This means that students who successfully graduate (with at least second class Honours) achieve the ‘graduate recognition’ needed to pursue a career in psychology. Many students continue with further study and research, and graduates are eligible for admission to professional courses in clinical, educational, forensic or applied psychology. Recent graduates of psychology at Cambridge have gone on to positions in psychology and related fields, as well as careers in social, community and charity work, research and teaching. Our course also equips you with skills and knowledge applicable in a range of professional sectors, including the media, management, the Civil Service, finance, law and business. Teaching is provided through lectures, classes or seminars, and supervisions. Some papers include a practical element, which takes place in laboratories. You can typically expect two lectures a week for each paper. You also have one or two supervisions a week to discuss your work and develop your reasoning and ideas. At the end of the year, you sit a three-hour written examination in each paper. Part IB provides a foundation for the research-led teaching of the final year while also allowing you to begin to specialise in those areas that most interest you. You sit a written exam in each paper at the end of the year. In your final year, you undertake a research dissertation of 7,000 words on a psychology topic of your choice. You also choose a further three papers from a selection available, each of which is assessed by a written examination. For further information about studying Psychological and Behavioural Sciences at the University of Cambridge see the Psychological and Behavioural Sciences Tripos website. See PBS: Subject Requirements and Typical Offer by College for College-specific requirements/preferences. All undergraduate admissions decisions are the responsibility of the Cambridge Colleges, so please check College websites for further details. See also Entrance requirementsand The Subject Matters for additional advice about general requirements for entry, qualifications and offers. All applicants are required to take the pre-interview written assessment for PBS at an authorised centre local to them (for a lot of applicants, this will be their school/college). The pre-interview written assessment for PBS will be taken on 30 October 2019. Please check the Cambridge Assessment Admissions Testing website for scheduled start times. Psychological and Behavioural Sciences Tripos - Find out more about Psychological and Behavioural Sciences (PBS) on the course website. PBS FAQ - Frequently asked questions about the PBS course. Course leaflet - An overview of the PBS course can be found in the leaflet 'Studying Psychology at Cambridge'. Course structure - Find out more about the PBS course structure. Preparatory reading - A short recommended reading list can be found towards the bottom of the FAQ page. Preparing for the TSA Cambridge - Resources to help prepare for the TSA (required for Psychological and Behavioural Sciences at some Colleges). Includes practice tests, suggested textbooks and further reading. Career Prospects - Read about the excellent career prospects of the PBS course.